I don’t mean the headline of this post as a good thing. I’m not saying that this is a iPhone photo app that is for playing games. I’m pointing out that you need to look over photo apps before you buy. 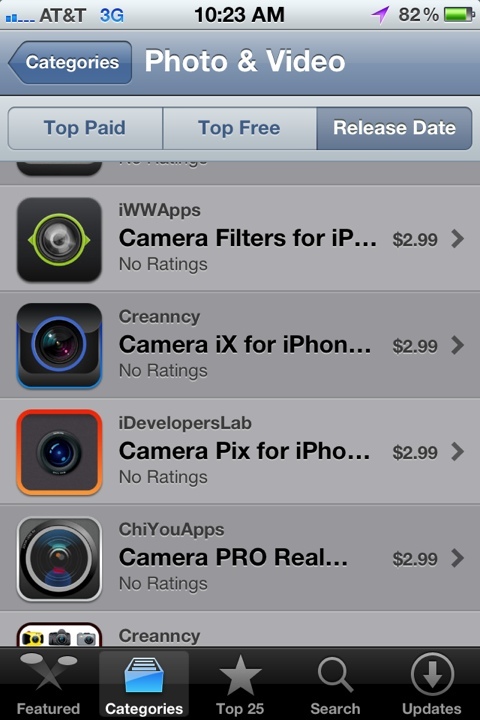 The below screen shot is of several apps that are for editing photos taken with your iPhone, all listed as different apps by different developers. Yet, if you take the time to look at them, you will see a common feature set. They all have a image of a back of a camera body with a spot to see what your taking the picture of. Each has a different camera but the differences stop there. All with a very limited list of features leading off with many filters. They don’t know how many filters they put in their program? Just take a minute to look at an app before buying, many are very limited and usually cost the same or more of the real powerhouse editing apps.